There is much research that validates mentoring and leadership as key for ECE professionals. But structurally speaking, it’s easier said than done in a sector beset by underfunding. How, in these times, to commit time and resource to mentoring and leadership development? This book offers both inspiration and practical advice. If you subscribe to Martin Heidegger’s view that the purpose of education is “the transformation of the self” then mentoring, by extension, is transforming the self and others by continuous mentoring. Mentoring takes us from an individualised experience to a collaborative professional relationship. It is increasingly important for supporting teachers beginning their careers and keeping great teachers. A commitment to developing teachers and future leaders endorses ECE as an inquiring and professionally confident career. 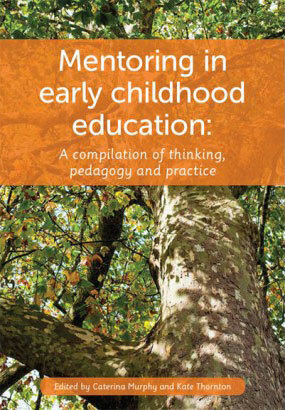 Mentoring in early childhood education is a collection of 22 essays from New Zealand and Australia, that offers insights into leadership practice, leadership development and leadership in professional learning communities. The essays are grouped into five parts. The first, on mentoring and professional learning, will appeal to ECE leaders and future leaders. The next, on Māori perspectives, offers a range of historical and current perspectives on the role of pou tautoko (mentors). Part three, mentoring student teachers, looks at the challenges of mentoring teachers on practicum (under tight timeframes), making judicious assessments and maintaining professional respect. Part four, mentoring through appraisal and registration, makes a strong case about the quality of mentoring impacting on the motivations and quality of teaching. The last part, mentoring complexities and future directions, cautions against focusing on a narrow frame of “performance”, rather than having liberating conversations that focus on professional practice.